One of the things I love about the Edwardian era is the relative freedom allowed between the mingling of men and women. No longer was the chaperon required to dog the steps of aristocratic young women, and no longer were gentlemen forbidden to form friendships with women. Once meeting in a suitable “At Home,” a lady and a gentleman could dine in a superior restaurant, play tennis at Wimbledon or even go punting with friends along the Thames. A new and exciting development in this period was the thé dansant, or tea dance. An afternoon or early evening dance evolved from the concept of the afternoon tea, young men and women didn’t have to wait for a ball hosted by their parents or anyone of the older or married generation–they could dance to their hearts content in the numerous tearooms springing up all over London. The most popular tearooms being the A.B.C. (Aerated Bread Company) and its direct competitor, Lyons Corner Houses, these rooms came complete with palm courts and the live orchestra who played light classical music known as “palm court orchestras”. 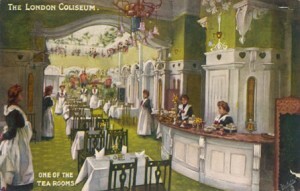 Tea rooms were added to all of the major hotels, department stores, and even a few theatres such as the Coliseum(right). “At the Cecil and Waldorf,” reported a Times correspondent, “there was ragtime during supper and ragtime afterwards, and at most places that boasted orchestras, guests danced to ragtime until the small hours of the morning. And so, fortified by a High Tea consisting of tea, cold meats and sandwiches, our Edwardian gentlemen and ladies bunny-hugged, turkey-trotted, waltzed and cakewalked to their hearts content, unhampered by the restrictions of contact between men and women of previous generations.